Little Venice is a picturesque area of North London near Paddington station, where Sally and her friends are having a long overdue catch up. Although this card was apparently written in London on mothers’ day (6th March 2016), the postmark, ’10-03-2016 Dorset & S.W. Hants’, indicates that it was posted several days later. The card carries a first class stamp, which is purple instead of the usual red. The purple stamps are being issued for one year to commemorate the record breaking reign of HRH Queen Elizabeth II – on 9th September 2015 Queen Elizabeth became the longest reigning monarch in British history. 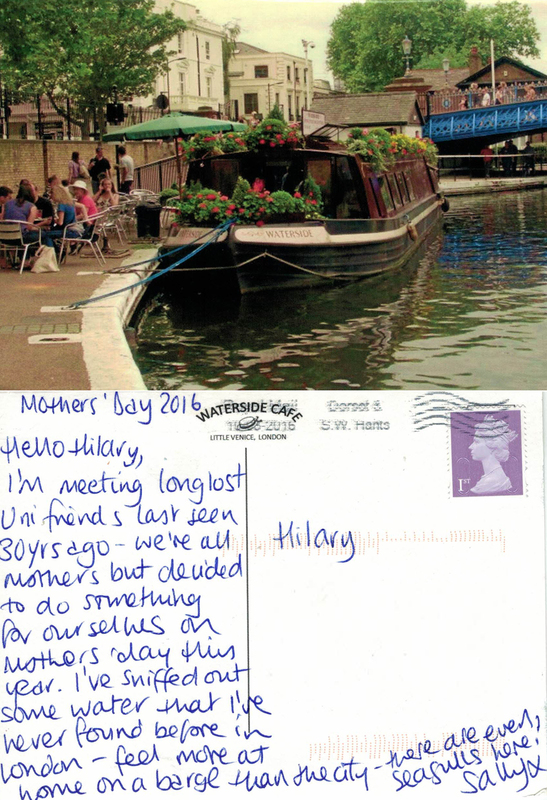 This entry was posted in autobiography, Friendship, Life Path, Postcards, Social History, writing and tagged daughters, friends, Little Venice, London, Mothers' day, postcards, purple, Queen Elizabeth, school, travel, writing. Bookmark the permalink.